The present state of the trends of the use of herbaceous species of Paeonia L. was studied and their prospects for greening the Podillya area were determined. The cultivars and hybrids of peony culture are investigated, entered in the State Register of Ukraine and analyzed the dynamics of their creation over the years. The analysis of researches and publications of cultivars of milky-flowered breeding breeding in our country was carried out. The decorative properties of the herbaceous peony varieties (Paeonia lactiflora Pall.) Were analyzed and the characteristics of the varieties represented by the originator of the varieties represented by all indicators were studied. According to the results of the research, Paeonia L. varieties, which are entered in the State Register on a set of indicators that determine their decorative and economic and biological qualities, are recommended as objects for the enrichment of the plant variety for planting the Ukraine. The analysis of species and grade composition of Paeonia L.
Bessonova, V.P. (2010). Roslyny kvitnykiv. Dovidnyk, Dnipropetrovsk: Vyd-vo «Svidler A.L.» (in Ukraine). Bruks, Dzh (2009). Kratkaia entsyklopedyia sadovoho dyzaina. ZAO «BMM» (in Poland). Horobets, V.F. (2017). Stvorennia vitchyznianykh sortiv pivonii z vykorystanniam metodu viddalenoi hibrydyzatsii. Faktory eksperymentalnoi evoliutsii orhanizmiv, 2, 128-132 (in Ukraine). Kataloh sortiv roslyn, prydatnykh dlia poshyrennia v Ukraini na 2018 rik (vytiah), (2018), 412-414 (in Ukraine). Laptiev, O.O. (2001). Introduktsiia ta aklimatyzatsiia roslyn z osnovamy ozelenennia. Kyiv, Fitosotsiotsentr. (in Ukraine). Markovskyi, Yu. (2002). Dekoratyvnue mnoholetnyky. SPb., Myr y semia, (in Russian). Mazur, V.A. (2018). Primary introduction assessment of decorative species of the lupinus generation in Podillya. Scientific Bulletin of UNFU, 28(7), 40–43. https://doi.org/10.15421/40280708 (in Ukraine). Mazur, V. A., Didur, I. M., Pantsyreva, H. V., & Telekalo, N. V. (2018). Energy-economic efficiency of grain-crop cultures in the conditions of the right-bank Forest-Steppe of Ukraine. Ukrainian Journal of Ecology, 8(4), 26-33 (in Ukraine). Mazur, V.A., Mazur, K.V., Pantsyreva, H.V., & Alekseev, O.O. (2018). Ecological and economic evaluation of varietal resources Lupinus albus L. in Ukraine. Ukrainian Journal of Ecology, 8(4), 148-153 (in Ukraine). Mazur, V.A., & Pantsyreva, H.V. (2017). Vplyv tekhnolohichnykh pryiomiv vyroshchuvannia na urozhainist i yakist zerna liupynu biloho v umovakh Pravoberezhnoho Lisostepu. Silske hospodarstvo i lisivnytstvo. Vinnytsia, VNAU, 7(1), 27-36 (in Ukrainian). Pantsyreva, H.V. (2016a). Vplyv elementiv tekhnolohii vyroshchuvannia na indyvidualnu produktyvnist roslyn liupynu biloho. Visnyk DDAEU, Silskohospodarska ekolohiia. Dnipro, Ahronomichni nauky, 2. (in Ukrainian). Pantsyreva, H.V. (2016b). Doslidzhennya sortovyx resursiv lyupynu bilogo (Lupinus albus L.) v Ukrayini, (Vol. 4, pp. 88–93). Vinnycya (in Ukraine). Pantsyreva, H.V. (2017). Formuvannia zernovoi produktyvnosti liupynu biloho zalezhno vid tekhnolohichnykh pryiomiv v umovakh pravoberezhnoho Lisostepu. Dys. na zd. nauk. st. k. s.-h. n. Kam’ianets-Podilskyi, 100-101 (in Ukrainian). Pantsyreva, H.V. (2018). Research of sortal resources of grape species of Paeonia L. in Ukraine. Scientific Bulletin of UNFU, 28(8), 74–78. https://doi.org/10.15421/40280815 (in Ukrainian). Sakhatska, I.M. (2012). Vstanovlennia zhyrnokyslotnoho skladu korenevyshch z koreniamy pivonii likarskoi sortiv «ALBA PLENA» ta «ROSEA PLENA». Ukrainskyi medychnyi almanakh, 15(1), 139-140 (in Ukraine). Sowling, W.A. (1994). Plant breeding for stable agriculture: Presidential Address. Western Australia, 183-184 (in Australia). Sydoruk, T.M. (2007). Travianysti bahatorichni roslyny vidkrytoho gruntu Natsionalnoho dendroparku «Sofiivka». Uman: UVPP, 115-122 (in Ukraine). Talibov, T.H., & Ibrahimov, A.Sh., (2008). Taxonomic spectre of the flora of Nakhchivan Autonomous Republic. Nakhchivan: Ajamy, (in Azerbaijan). Vdovenko, S.A., Prokopchuk, V.M., Palamarchuk, I.I., & Pantsyreva, H.V. (2018). Effectiveness of the application of soil milling in the growing of the squash (Cucurbita pepo var. giraumontia) in the right-benk forest stepp of Ukraine. Ukrainian Journal of Ecology, 8(4), 1-5 (in Ukraine). Vdovenko, S.A., Pantsyreva, G.V., Palamarсhuk, I.I., & Lytvyniuk, H.V. (2018). 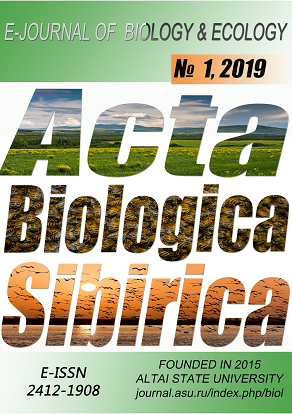 Symbiotic potential of snap beans (Phaseolus vulgaris L.) depending on biological products in agrocoenosis of the right-bank forest-steppe of Ukraine. Ukrainian Journal of Ecology, 8(3), 309-314.